While football fans were purring in appreciation at the dazzling dribbling skills exhibited by French international Jérémy Menez that sealed Roma’s comprehensive 3-0 victory against Cagliari at the weekend, it may have escaped their attention that the giallorossi had stealthily moved into third place in Serie A after winning five of their last six games, which is some comeback after their indifferent start to the season. 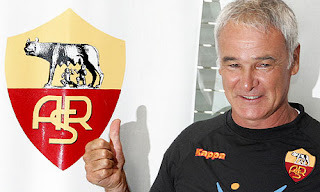 In fact, it’s beginning to look like this year could be a repeat of last year’s heroics, when Claudio Ranieri’s team staged a remarkable recovery to finish as runners-up to José Mourinho’s all-conquering Inter team, guided by their charismatic captain, Francesco Totti. However, as important as these victories are to Roma’s campaign, this is not the greatest challenge facing the grand old club these days, as their very existence has been called into question. With depressing inevitability, their problems off the pitch came to a head last summer, when the club was officially put up for sale, after many years of financial difficulties. 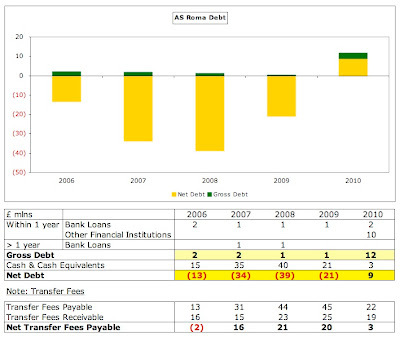 They reported a thumping great €22 million loss in 2009/10 and have a large hole in their balance sheet. This has resulted in them struggling to pay their wages, so much so that the players only received their money for July, August and September in November - on the very last day that they could be paid without the league imposing a points penalty. Unsurprisingly, this has caused the supporters great consternation, as there is a clear risk that players could be sold to shore up the club’s finances with some talk of Montenegrin striker Mirko Vucinic being allowed to leave. Some players’ contracts are coming to an end, including faithful servants such as centre-half Philippe Mexès and midfielder Simone Perrotta, who could depart on free transfers if their agreements are not renewed. Even if Roma manage to retain these players, they will have to find money from somewhere to reinvigorate an ageing squad at some time. It seems incredible that a prestigious club like Roma could be in such dire straits. After all, this is one of Italy’s most successful clubs, having won the Serie A title three times, most recently in the memorable 2000/01 season under Fabio Capello with a team featuring the attacking talents of Gabriele Batistuta, Vincenzo Montella and that man Totti. They have also seen European glory twice narrowly elude them, losing out to Liverpool in the 1984 European Cup after a penalty shoot-out and their perennial rivals Inter in the 1991 UEFA Cup. It’s not all ancient history either, as the last decade has arguably been one of their best ever, at least on the pitch, as they captured one scudetto, finished second in the league on no fewer than six occasions and reached the Italian Cup final six times, winning twice (in 2007 and 2008). According to research by the Italian media, Roma is the fifth most supported club in Italy, only behind Juventus, Inter, Milan and Napoli. So, the obvious question is what on earth has gone wrong? Many commentators speak of the club’s enormous debts, but that’s not strictly accurate. The club itself has a very small net debt of €9 million and has actually had a cash surplus for the previous few years, which is a notable achievement in the highly pressurised world of football. Even the net balance owed on transfer fees, which can be very high at Italian clubs, is only €3 million. However, the problem is that the club’s owners, the Sensi family, which owns the club via its oil storage company Italpetroli, do have huge debts with the banks. These were around €405 million at the last count with €325 million being owed to Unicredit and €80 million to Monte dei Paschi di Siena, but they are probably even higher now. You might be forgiven for thinking that this has nothing to do with the football club, but unfortunately there is an impact, as the main creditor Unicredit, which is facing challenges of its own in the troubled banking sector, has insisted that Italpetroli clears its debts and the only way of doing that is for the company to liquidate its assets, including AS Roma, which is now very much in the shop window. "Rosella Sensi - no smoke without fire"
Italpetroli is in a desperate situation with bankruptcy threatened and auditors questioning their accounts, so they have no other viable options remaining. Indeed, Unicredit has already taken control of the Sensi family’s other assets, leaving them with just their residential properties. The owners’ financial difficulties also obviously mean that they have no spare money to invest into the club. The Sensi family has held a majority stake (67%) in Roma since 1993, though times have undoubtedly changed since Franco Sensi used to boast, “13% of Italians travel around using my oil.” Although initially criticised by the club’s passionate support (“Sensi senza senso”), the fans slowly warmed to Franco, especially when he opened his cheque book to buy the likes of Batistuta, Emerson and Walter Samuel, the highlight being a memorable celebration in the Circo Massimo to honour the championship win in 2001. However, after his death from illness two years ago, his daughter Rosella took charge and, since then, the future of the club has been uncertain with frequent speculation about a change in ownership. At the same time, fans have been unhappy with the lack of investment by the owners in recent years. In the last two seasons, Roma have spent relatively little in the transfer market with the only signings of any note being Nicolás Burdisso and Marco Motta. Indeed, they have actually generated net sales proceeds of €19 million in that time, largely thanks to the sale of creative midfielder Alberto Aquilani to Liverpool. This total was only surpassed by Udinese, a club famous for doing prodigiously well at making money from transfers, and the Milan giants, whose figures were boosted by the extremely lucrative sales of Zlatan Ibrahimovic to Barcelona and Kaká to Real Madrid, while all other clubs in Serie A spent more than Roma. Although Rosella continues to hold the reigns, her position as president is a nominal one, merely ensuring continuity in the interim period, and in reality it is now the bank that is calling the shots. Ever since 2004, when it acquired Capitalia, another bank that helped restructure Italpetroli’s debt, Unicredit has owned 49% of Italpetroli, but it clearly has little desire to own a football club, which it effectively does now through its control of Italpetroli’s 67% stake. This helps explain its decision to sell the club, an agreement that Sensi admitted was needed in order to “safeguard” the club’s future. 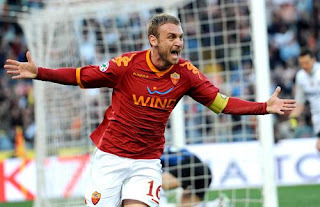 "The grinta of Daniele De Rossi"
The requirement for someone else to take control has been amply evidenced since the summer with Unicredit having to advance €15 million in September to finance the transfer market acquisitions campaign, though €11 million of that was reportedly repaid in October, and a further €25 million in November to cover the wage bill, though this has been supported by a factoring arrangement, whereby some of the club’s future television receipts have been passed to the bank in exchange for the injection of cash. Rothschild has been appointed as the advisor tasked with finding a buyer for the club, a process that has been facilitated by creating a new company, imaginatively named NewCo Roma, for Italpetroli’s 67% share. The division of ownership in NewCo remains unchanged with the Sensi family holding 51% and Unicredit 49%, but, importantly, Sensi cannot prevent a sale to a buyer deemed acceptable by the bank. At the point of sale, she will have to step aside. However, it has not proved to be as easy to sell the club as Unicredit would have hoped. Having signed the agreement to place Roma on the market in July, they initially hoped that the process would be completed in September (“we’ll find a buyer in three months”), but that always appeared overly optimistic. That date passed, as have a number of others, with the deadline first being slipped to November, then extended to December, leaving the latest date for bids as the end of January. In fairness, the sale was somewhat comprised by the resignation of Unicredit’s CEO, Alessandro Profumo, in September, nor was it helped by Roma’s disappointing start to the season, but all these delays don’t exactly encourage the thoughts of a positive outcome. "Philippe Mexes - the French connection"
One potential barrier to completing a sale might be the price being asked by Unicredit. It is understood that the minimum they are looking for is €100 million, though they are believed to be hoping for €130-150 million. Interestingly, the Sensi family will receive 5% of any figure above €100 million, so it is in their interest to help achieve the highest price possible. Before the economic crisis struck a couple of years ago, analysts thought that the club was worth at least €200 million, so the most opportune moment to find a new owner has almost certainly long since passed. Indeed, a couple of years ago, it was reported that billionaire financier George Soros had made a €283 million bid for the club through his global sports investment arm, Inner Circle Sports, though this has never been confirmed. There have been many expressions of interest over the last few years from all corners of the world, but, for one reason or another, they have never come to fruition. Unicredit appears unruffled: “The sales process continues as planned” and “We are still in discussions with a number of potential purchasers to whom we have provided further details as a preparation for binding offers.” In spite of these bland words of comfort, the fans are understandably still nervous, given how long the procedure is taking. Nothing is known for certain about any prospective owners, but the short list would appear to have come down to three reasonably credible candidates: (a) Aabar Investment, the sovereign wealth fund of Abu Dhabi, already owns 5% of Unicredit and would surely have the resources to both finance a bid and make investments into the club. (b) The Angelucci group, whose wealth is primarily derived from health clinics, though it also publishes “Libero” and “Il Reformista”, is reported to have already made an offer of €86 million. This low bid has been cited as evidence that this group would not have sufficient capital to make a success of the club. (c) A mysterious American entrepreneur, whose name has not been divulged, though some have suggested that this might well be John Fisher, the owner of the Gap clothing empire, who has approached Roma in the past, or even Steve Tisch, owner of the New York Giants. 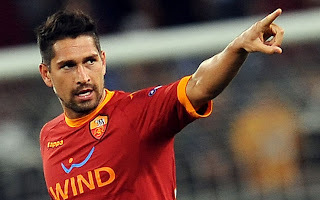 "Marco Borriello shows the way ahead"
Many others have seemingly fallen by the wayside, including Francesco Angelini, the wealthy owner of a pharmaceutical company; Clessidra, an Italian private equity firm; and Naguib Sawiris, the Egyptian entrepreneur, who owns telecoms provider Wind, which just happens to be Roma’s main sponsor. Expressions of interest have also apparently been heard from the usual suspects in Asia, China, India and Russia, but that’s just par for the course when a football club is put on the block. So, what sort of business would a buyer get for his money? On the face of it, the profit and loss account does not look too bad up until last year, when the club reported a hefty €22 million loss. In the four previous years, they made two large profits (€14 million in 2007 and €20 million in 2008) and two small losses (€4 million in 2006 and €1 million in 2009). In a way, the 2010 loss was perfectly understandable, as the revenue dropped dramatically by €24 million, largely due to the failure to qualify for the Champions League. However, there are two reasons why this loss was worrying. First, even though the revenue fell, there appeared to be no attempt to compensate by cutting costs; in fact, they slightly increased. Second, the loss was incurred despite a very healthy €19 million profit on player sales, the highest recorded in the last five years. Unfortunately, the loss next year is likely to be at least as high. The club has not provided an estimate, but has warned that, “2010/11 will close with a significant loss, which will require some form of financing.” The Italian media has spoken of a loss as high as €40 million, though this will be impacted by a number of factors. On the plus side, the return to the Champions League will make a material difference to the revenue, but this will be reduced by the new collective agreement for TV rights. Furthermore, the moribund nature of the transfer market last summer means that there will be a limited profit from player sales – unless one of Roma’s higher rated players is sold in the January window. Actually, the lack of sales activity had a double whammy impact, as Roma were unable to meaningfully reduce their wage bill. At first glance, Roma’s revenue does not look too bad. 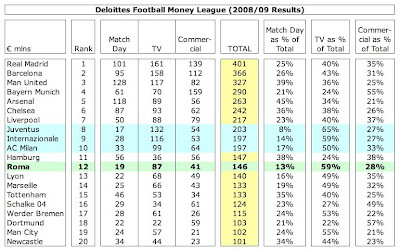 If we look at the Deloittes Money League for 2008/09 (the most recent season available), which ranks clubs in order of their revenue, we can see that Roma are reasonably well placed in 12th position with €146 million, just ahead of Champions league regulars Lyon. However, a closer inspection reveals some weaknesses. For example, their revenue is a long way behind the Spanish powerhouses, Real Madrid and Barcelona, whose revenue is around the €400 million mark, which might be expected, but it’s also much lower than the leading English clubs, whose revenue is at least €100 million higher. While Roma are settled in the cluster of four Italian clubs, it should be emphasised that the triumvirate of Juventus, Inter and Milan all earn around €50 million more, largely because those clubs have better TV deals, but also because they have better exploited commercial opportunities. Nevertheless, the club’s revenue still represents a solid foundation upon which a new owner could build and that gap could represent a realistic growth target. Two other observations really hit you in the face. Roma’s match day revenue of just €19 million is extremely low, so much so that it’s actually the second lowest of any team in the top twenty clubs listed in the Money League, representing only 13% of the club’s total revenue. On the other hand, the huge reliance on television revenue of €87 million is all too evident, as this accounts for a weighty 59% of total revenue. 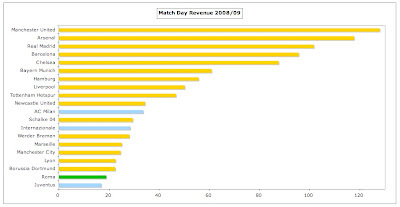 In fairness, this fell to 54% in 2009/10, but this was more due to the absence of Champions League money than any growth in other revenue streams. Before further commenting on the revenue, I should explain that the figures in my analysis are different from those quoted by Roma. In order to be consistent with other clubs, I have followed the definition used in the Deloittes Money League. For example, their latest report excluded the following items: (a) gate receipts given to visiting clubs €3.1 million; (b) TV income given to visiting clubs €11.4 million. Adding the total adjustments of €14.5 million to the Money League revenue of €146.4 million gives the €160.9 million revenue reported by AS Roma SpA. Roma generated €87 million TV revenue in 2008/09, including €60 million from the domestic broadcasting deal with Sky/Mediaset and €26 million from the Champions League. The 24% decrease (€21 million) in 2009/10 was almost entirely due to the fact that Roma only qualified for the Europa League, which brought in a paltry €2 million. 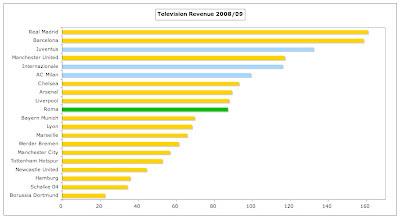 If you’re wondering why the TV revenue was so high in 2007/08 at €106 million, this was again partly because of the Champions League (worth €29 million that year), but also due to a once-off payment of €15 million for domestic TV rights. Up until now Roma have benefited from selling their TV rights individually, though their €60 million deal (net of mutuality payments) is still a long way short of the €90-100 million deals negotiated by Juventus, Inter and Milan. As from the 2010/11 season, this structure has been replaced by a return to a centralised collective deal, which Roma have advised will lower their TV income, though they have yet to quantify the magnitude of the reduction. The decrease may not be quite as bad as some fear for a couple of reasons. First, the total money guaranteed by exclusive media rights partner Infront Sports will be approximately 20% higher than before at over €1 billion a year. Second, the complicated distribution formula still favours the bigger clubs like Roma: 40% will be divided equally among the 20 Serie A clubs; 30% is based on number of fans (25%) and the population of the club’s city (5%); and 30% is based on past results (5% last season, 15% last 5 years, 10% from 1946 to the sixth season before last). Nevertheless, there is still talk of top-flight Italian clubs breaking away to form Lega Calcio Serie A in an attempt to emulate the English Premier League and increase their share of television revenue. As we have seen, qualification for the Champions League is imperative for Roma’s business model and unsurprisingly the club’s accounts identify this as one of the key risks influencing the club’s economic prospects. It’s not quite as straightforward as saying that the club makes a profit in years when it reaches the Champions League and makes a loss when it fails to do so, but that’s not a million miles from the truth. The accounts actually state that the total revenue difference between the Champions League and Europa League amounted to a whopping €26 million, when additional gate receipts and increases in sponsorship payments are included. 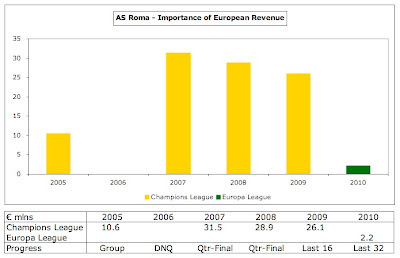 As an illustration of the “Champions” effect, in the purple patch between 2007 and 2009, during which Roma reached the quarter-finals twice and the last 16 once, the TV receipts alone averaged a very handy €20 million a season. The payments have risen since then, so if Roma were to again reach the quarter-finals this season, which is an entirely feasible target, given that they have been drawn against the inconsistent Ukrainian side Shaktar Donetsk in the last 16, they could expect to receive at least €30 million. Another area where Roma have lagged behind their Italian counterparts is the commercial operation, which generated only €38 million last season (€41 million in 2008/09). To place that into context, Milan earned €64 million, Juventus €54 million and Inter €53 million. The deficit is explained by the differences in the main two sources of commercial revenue, where the other clubs earn more: (a) shirt sponsorship: Roma – Wind €7 million, Milan – Emirates €12 million, Juventus – Betclic €8 million, Inter – Pirelli €9 million; (b) kit supplier: Roma – Kappa €5 million, Milan – Adidas €13 million, Juventus – Nike €12 million, Inter – Nike €18 million. 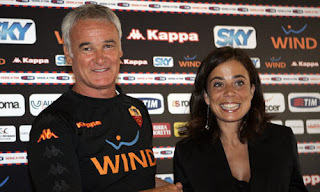 Actually, the situation is even worse at Roma, as the agreement with Wind, the shirt sponsor, was extended by three years to conclude in June 2013 at a lower guaranteed amount. Previously, this had been €7 million, but is now scheduled to be: 2011 €5 million, 2012 €5.5 million and 2013 €6 million, though this will be increased by €1 million for every season in the Champions League. This does not seem to me to be a wonderful demonstration of negotiating skills, but let’s not forget that this is a club that recently went an entire season without a main sponsor. In fairness, the Kappa equipment deal does have built-in increases from €5 million to €8 million over the course of the contract running until 2017. 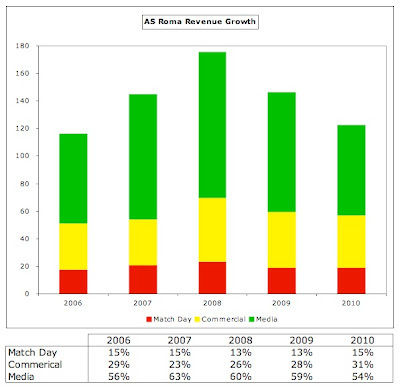 Even though there is plenty of room for improvement in marketing, Roma’s real revenue weakness is match day revenue, which is extremely low at €19 million. To be fair, this is a well-known issue in Italy, as we can see in the Money League, where the four Italian clubs all languish in the bottom half of that table. That said, it’s clearly more of a problem at Roma (and Juventus €17 million) than Milan €33 million and Inter €28 million. More importantly, this revenue is miserably low, compared to their European peers. At the other end of the spectrum, Manchester United and Arsenal generate €128 million and €118 million respectively, which is more than six times as much as Roma. That’s a huge competitive advantage for the English clubs, especially as it happens every single season. The difference is largely attributable to ticket prices, but it’s also down to smaller crowds. Last season, Roma’s average attendance of 41,000 was up 4% and was the third highest in Italy, only behind Inter 56,000 and Milan 43,000, but this was still only the 28th highest in Europe. Also of concern is the fact that Roma only fill 56% of the 72,700 capacity of the Stadio Olimpico, which is the lowest percentage of all Money League clubs. This only emphasises the need for Roma to address the issue of their stadium, which is owned by the local council, rented by the club and shared with city rivals Lazio, thus reducing its revenue generating capacity. The lack of ownership means that they miss out on profitable opportunities like premium seating, corporate boxes, restaurants, retail outlets, naming rights and non-sporting events. 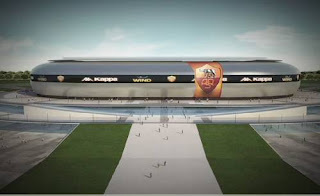 That is why in September 2009 Roma unveiled plans to build a new 55,000 capacity stadium in the Aurelia zone of the city with Rosella Sensi explaining, “It’s a project to bring economic stability to the club.” Although the ground would be smaller, it would generate much more revenue. In particular, premium seats could make a big difference, if you consider that Arsenal make 35% of their match day revenue from just 9,000 premium seats at the Emirates. Significantly, all of this income would go directly to the club, as they will no longer have to share it with Lazio or the local council. Obviously, there’s no such thing as a free lunch and a new stadium would require a huge initial outlay (estimated at around €300 million) and is not necessarily a magic bullet, given that it would be difficult to raise ticket prices in an economic recession, but it could have a dramatically beneficial impact on Roma’s revenue. 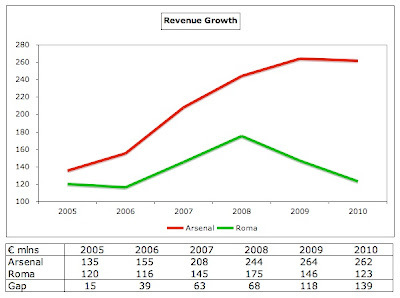 You only have to look at how the gap with Arsenal’s revenue has grown from €15 million in 2005 to €139 million in 2010, with most of the growth coming since 2007 – the first year that the Emirates became operational – to appreciate that it could be worth the risk. Indeed, this way of thinking has been embraced by other Italian clubs. Juventus’ plans to move to a new stadium are well advanced, while Inter continue to negotiate with their council to move away from San Siro. However, since the 2009 announcement, little more has been heard from Roma about a new stadium, which might be linked to their financial difficulties, though some fans suspect that it was little more than a smoke screen designed to deflect criticism away from the owners. 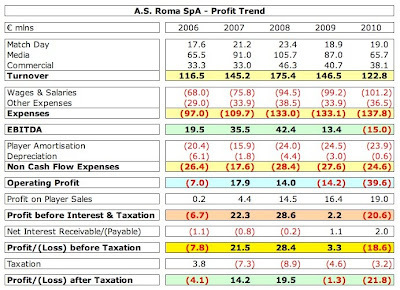 All in all, Roma’s revenue is not too shabby, but the problem is that it’s not enough to cover costs, leading to a €15 million loss after cash expenses and a €40 million loss after amortisation (and before profit on player sales). As with all football clubs, the largest expense is wages, which have increased by nearly 50% in the last four years from €68 million to €101 million, even though revenue has only grown by 5% in the same period. 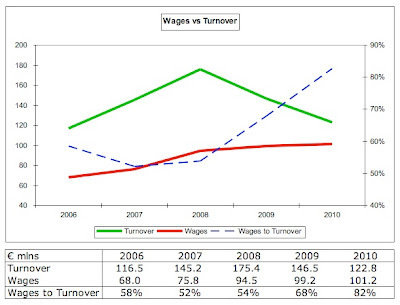 This trend is most apparent in the last two seasons, when the wage bill steadily grew, even as revenue declined, producing an unsustainable wages to turnover ratio of 82%, which is far higher than UEFA’s recommended maximum limit of 70%. Admittedly, Roma’s wage bill of €101 million is much lower than their rivals from the north (Inter €205 million, Milan €172 million and Juventus €138 million), but it is still the fourth highest in Italy and around twice as high as the likes of Lazio, Fiorentina and Genoa. Although the payroll has been lightened with the sale of Julio Baptista to Malaga and the loan of Cicinho to Villarreal, the accounts reveal the significant cost of extending player contracts, e.g. 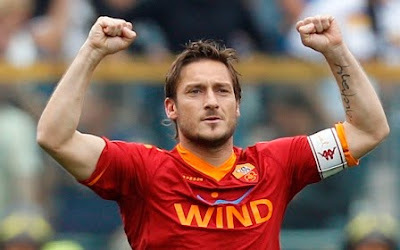 Totti’s deal runs to 2014 at €8.6 million a year. Roma fans might also be interested to know that Rosella Sensi received compensation of a tidy €1.1 million, which begs the question of how much she would be paid if the club were actually profitable. In contrast, player amortisation has held steady at around €24 million in the last three years, which is on the low side compared to other leading Italian clubs: Inter €50 million, Milan €41 million and Juventus €34 million. Remember that amortisation is the annual cost of writing-down a player’s purchase price. For example, Nicolás Burdisso was signed for €8 million on a four-year contract, but his transfer is only reflected in the profit and loss account via amortisation, which is booked evenly over the life of his contract, i.e. €2 million a year (€8 million divided by four years). Thus, the total cost of player purchases is not immediately reflected in the expenses, but increased transfer spend will ultimately result in higher amortisation. Therefore, the fact that amortisation has not increased would imply that Roma have not spent big in the transfer market and that is indeed the case, at least recently. In the five years up to 2003/04, Roma clearly splashed the cash with net spend of a not inconsiderable €183 million on players of the calibre of Batistuta, Cassano, Montella and Nakata, but they have only incurred net spend of €3 million in the seven years since those heady days. The annual report explained that the club could only afford “smaller investments, due to fewer available resources” and they have had to box clever, recruiting the Brazilians Adriano and Fabio Simplicio on free transfers (though on high wages) and taking prolific forward Marco Borriello from Milan on loan (with an agreement to buy him for €10 million next season). This an example of Roma’s need to conserve cash, which is evidenced by the cash flow statement. Over the last two years, the cash outflow of €47 million has been even higher than the reported losses of €23 million, which rings a large alarm bell, especially as this excludes €52 million of amortisation. There have been rumours that the commercial deals were extended at such a low rate in order to get some of the money upfront, but the accounts explicitly mention a number of arrangements whereby TV revenue has been sold in order to access funds now. "Adriano - a huge investment in both senses"
That sort of arrangement would raise a red flag to most investors, which might explain why the interest of so many possible buyers goes cold when they undertake due diligence and have the opportunity to examine the club’s books in detail. It’s as if they look at the high-level numbers and think that they could make a go of it, but there are too many skeletons in the closet for their liking. Of course, Roma does possess hidden assets too, namely their players, who were valued at a conservative €42 million in the balance sheet, but are worth considerably more in the real world – a staggering €215 million according to Transfermarkt. Unfortunately, the only way of realising the value of these assets would be to sell players like the popular Daniele De Rossi, which would hardly endear a new owner to the fans. In addition, any rational investor would look at the market in which a potential acquisition operated, which does not exactly provide a comforting picture. Although Serie A football remains fascinating and continues to produce more than its fair share of Champions League winners, there are numerous problems: outdated stadiums, falling attendances, outbreaks of hooliganism and the complicated “tessera del tifoso” process, which makes it more difficult to just turn up at a match. "Mirko Vucinic - it's a celebration"
Consequently, Italian clubs have reported some of the largest losses in football. In the last three years, Inter made cumulative losses of over €500 million, while Milan’s losses of €120 million in the same period would have been even higher without the €63 million profit made from selling Kaká. Even Juventus, who have been held up as a paragon of economic virtue in Italy, lost €11 million last year. Future financial prospects have been further damaged by the loss of a Champions League place to Germany. Of course, Italian clubs will not be able to ignore such losses in the future, even if they have a generous benefactor, as we are entering the era of UEFA’s Financial Fair Play Regulations, which will ultimately exclude from European competitions those clubs that fail to live within their means, i.e. make a profit. These will be implemented in the 2013/14 season, though the monitoring period will cover the preceding two reporting periods, 2011/12 and 2012/13, so clubs like Roma are under pressure to rapidly wipe out their losses. "The happy couple - but for how much longer?" Wealthy owners will be allowed to absorb aggregate losses of €45 million over three years for the first two monitoring periods, so long as they are willing to cover the club’s losses by making equity contributions, but the maximum permitted loss then falls to €30 million from 2015/16 and will be further reduced from 2018/19 (to an unspecified amount). Funnily enough, this additional governance could potentially help Roma, as their losses are within this “acceptable deviation”, while some of their competitors will have to slash and burn to get down to this level. There is little doubt that the right owner, i.e. one with considerable resources and a strategic vision, could make a significant difference to Roma. While it might be over-egging the cake to describe the club as a sleeping giant, it has a lot of strengths that have not been fully exploited, starting with a large, fervent fan base and a productive youth academy. If a new owner could also build a new stadium, and maybe persuade the local authorities to fund improved transport infrastructure, then this sorry saga might actually have a happy ending. Let’s hope so, as the world of football is a better place with a Bella Roma. 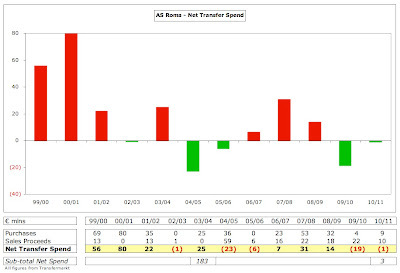 Good stuff, but doesn't AS Roma's fiscal year run from January to December, contrary to how you present it here? No, their accounts close on 30 June. You can find the annual reports (in Italian) on the Borsa Italiana website. Do you remember the good old days of Nottingham Forest in Europe? Yes, I do remember Forest's European Cup wins very well. Brian Clough was a bona fide genius. Sensational stuff. I don't know quite what more I can add. Just as I was reading this, italian TV RAI2 said that Roma is in advanced talks with the US group, because of the latest deadline of Jan. 31. Maybe just bla bla to fill the space. So in the end, reading here and there in your blogs, it is right to say that the healthiest football (for clubs & finances) is played in Germany? This does not seem to me to be a wonderful demonstration of negotiating skills, but let’s not forget that this is a club that recently went an entire season with a main sponsor. Pardon me for asking, but should this not be "an entire season without a main sponsor?" Love your site, keep up the great work, and let us know when you appear on podcasts! Thanks - you're absolutely right. I'll correct that. Thank you for the excellent analysis. You have a tremendous blog. Could this be said similarly to Udinese and Parma, these clubs and the rest of Italian clubs seemed always sell their players for high transfer but never affect the said clubs income positively; I wonder where all that money gone. Have you cover about this somewhere on your blog? If you haven't, I hope you kindly present your view regarding this on your future posts. Mr. Swiss, I don't know where you got the John Fisher tip, but I can categorically tell you it's a load of cack. You generally do your homework exceedingly well, but if your general premise of the potential big 3 owners is true, then your yank entry should be further researched. A few media sources have indicated that John Fisher might be behind an American investor bid, most recently the Roman newspaper Il Messaggero, though no name has been officially announced. That is why I limited my comment to, "A mysterious American entrepreneur, whose name has not been divulged, though some have suggested that this might well be John Fisher." What does appear to be clear is that there is interest from the Americans, as Unicredit representatives flew to New York yesterday for a meeting. Given that you claim to know so much about the sale, maybe you would care to share their identity? I've not written about Udinese or Parma yet, but may do in the future. You can find a list of all the clubs that I've reviewed on the left-hand side of the blog. "As we have seen, qualification for the Champions League is imperative for Roma’s business model and unsurprisingly the club’s accounts identify this as one of the key risks influencing the club’s economic prospects." This is the crux of the problem faced by many European clubs. The Champions League is so financially rewarding that clubs tend to budget with that in mind, especially if they have been playing in it for a couple of years. However qualification is not automatic, so if these clubs fail to qualify for CL they will have a deficit of around €10-20 million. Should they not budget for it and qualify, then they will get an extra €10-20 million which they then don't know what to do with. I blame UEFA for creating such a huge financial discrepancy between Champions League and the lesser tournaments. It's a big carrot for every club which puts pressure on them. 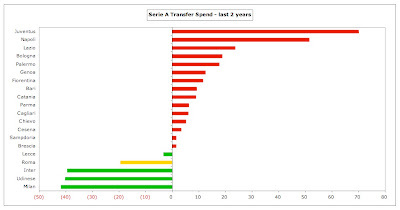 We have seen clubs struggle financially after failing to qualify for CL (Leeds Utd, Ajax, Valencia, Liverpool, etc). Even though Roma is currently third, Udinese in 8th is only 5 points behind so qualification for next year's CL is not easy for Roma, especially if we count the rift between Totti and Ranieri and the on-going sale of the club. Won't the Arabs be best placed to buy Roma because it is likely only they (Aabar is worth 18bn euros apparently) have the resources to build the stadfium, buy Italpetroli's shareholding and invest in the club and its squad? Great stuff, it amazes me that in Italy top clubs loan each other players. Sometimes I have difficulty reading the text in the pictures. Is there any way to enlarge them without just scaling up the page? Mr. Swiss, well the cats out of the bag stateside this morning, from Boston Investment Group, whom is also a partner in NESV called Di Benedetto is the man in negotiation. Being that you are imbedded in SZ, perhaps you might have insight if that will fly with UEFA/FIFA? I.e. someone who is a already part of a group who owns a major English side. In essence a single consortium could continue buying up major clubs in different leagues and have their own g14 lobbying entity. I didn't suggest in my post that I knew "so much about the deal" just that Fischer wasn't the investor in play. To be clear, I am a fan of your work. I have the same remark as Jim above. I'm a big fan of your articles and I really like to read them. But I often struggle to read the numbers in the graph. I would appreciate it if you could make them a wee bit bigger. Just on a point raised by basicfootball, do you feel UEFA are to blame? I'd love to read a blog (as in-depth as this is) on Leeds United's financial troubles, it seems like a fascinating story and it seems like they are on their way back. I import the graphs on the largest setting that the Blogger software allows, so I'm not sure if there's a way of making them any bigger. Any advice gratefully received. Wow, just great to read this. But indeed, try to make the images larger. I would suggest you to take a look at Standard de Liège, their finances could be interesting to look at. They played Champions League last year. The involvement of NESV is a strange one for the reason you mentioned, namely ownership of more than one club, though we don't have all the details yet. In the past, ENIC was forced to sell stakes in a number of clubs, leaving them with just Tottenham. First time reader but already a big fan. A roma fan recommended me your blog and it gave a whole new insight in the club's possibilities and limitations. As a huge Lazio fan I would be extremely interested in a similar article about sslazio's current financial situation. Know you must get these kind of requests all the time but it would really help me to understand the difficulties of this proud clubs on the transfer market. From the impressing signing of Hernanes in the preseason to the problems of signing a quality forward even though the season until now has been way better than expected. Have these fuckers paid any tax any time recently ? A more informative view on my team in one article than I've garnered in four years of the Italian media. I think "sleeping giant" is actually not a bad term at all for Roma. They are the dominant football force in one of Europe's largest cities (ninth-largest metropolitan area by my count), in a football-mad country, they can be run consistently at a profit even on current lines (provided they make the CL 75% of the time), there is potential growth in TV money, and they have huge commercial and matchday possibilities if they can build their new stadium, for which plans are well advanced. So it seems to me Roma could easily grow into a financial and football force in Italy. I think it's odd that investors haven't cottoned to this - I can't even guess how much more attractive Roma would have been to me as a purchaser than, say, Manchester City - but it seems that the world's smartest sports investors have in fact cottoned to it. Oh. I mentioned the sleeping giants and the most attractive purchase options. There is only two clubs in the world I would want to get my hands on significantly more than Roma (excepting Madrid and Barcelona). One is Bayern Munich and the other is Paris St-Germain. and i was wondering, what does "tessera del tifoso" mean? Swiss Rambler, could you do an article on how Chelsea could possibly qualify for the financial fair play rule? I don't understand why they lose £70 million in their recent account, spend £75 million in the recent transfer window and still have the balls to claim that they are well placed to meet the financial fair play rules. yep,a follow-up on Chelsea would be greatly appreciated. I'm not entirely happy when people translate my articles, as it reduces traffic to my website, but I am grateful that you asked, so go ahead. "Tessera del tifoso" is a fan ID card. I may well do a follow-up analysis on Chelsea, though I would prefer to wait until the detailed 2009/10 accounts are released. So far, we only have the headline figures published on Chelsea's website. The use of the word 'simples' and all that talk of amortisation makes me think he must read this blog. I second the comment above regarding fair play rules. Except that my hoped-for post would be a general explanation of the fair play rules, loop holes and opportunities for gaming the system. I would be fascinating to read your informed and excellent financial analysis of how these rules will succeed or fail. care to comment on this whole Karen Murphy thing and its possible consequences for the customers and the european topleagues? Thanks for the heads-up. I was actually aware of this article, because the author gave me a "hat tip" in the comments below. I may well incorporate the Murphy ruling into a future broader article. I found this thoroughly interesting at the time you wrote it (as I do most of your blog pieces, especially those regarding calcio) and would be very interested to know your thoughts on the takeover by Di Benedetto & co.